Mallory Gaudion has had a passion for the arts of movement since the age of six. A few years later, he entered the Dance School of the Opéra de Paris, where he completed his dance studies. Under Serge Golovine, he joined the Corps de Ballet de l’Opéra de Paris in 1995, and performed in all the repertory of the famous opera, absorbing the visions and techniques of great dance masters such as Bournonville, Nureyev, Balanchine, Robbins, and Neumeier. At this time, the Paris Opera opened its doors to new choreographic inspirations. Mallory became one of the favourite dancers of Maurice Béjart for his performances at the Paris Opera: Boléro, Le Concours, IXème Symphonie, Le Sacre du Printemps and Le Mandarin Merveilleux. Mallory Gaudion also participated in the creations of Angelin Preljocaj (Mc14/22, Le Parc, Siddartah) and of William Forsythe (The Vertiginous Thrill of Exactitude). These meetings, as well as the even more important encounter with Sacha Waltz, fixed his desire to express himself through creation. From this desire have emerged several choreographic pieces: Abel était…, for the emerging choreographers performance at the Paris Opera (2003), White Lines, for the Verdure Festival in Palermo (2005), Chemins de traverse, at the Paris Opera (2006), A/R, for the young dancers of the national dance school of Paris (2006), Narcisse, for the Cross Connection Ballet in Copenhagen (2009) and Narkissos, for the Paris Opera (2011). Now, Mallory Gaudion is co-creating a performance of Gwladys Saligné (Théâtre en mouvement). He is also creating a new choreographic performance with the principal dancer Clairemarie Osta. Tutu-Dance Project brings together artists from many backgrounds in the world of body movement and artistic creation, particularly dancers, writers, and choreographers. 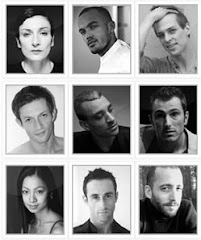 They share a desire to overcome artistic barriers and to foster exchanges with those working in other performing arts. From conception to interpretation, Tutu-Dance Project members stage their own works. Tutu-Dance Project - Performances We offer a show that is unique in character. Unique because the choreographer-performer invites the audience to seek new ways of seeing movement, expression, interpretation. Unique also because it enables organisers looking to create a show to choose choreographers and works that are well suited to the venue, audience and programming.